Vice presidential nominee Gov. 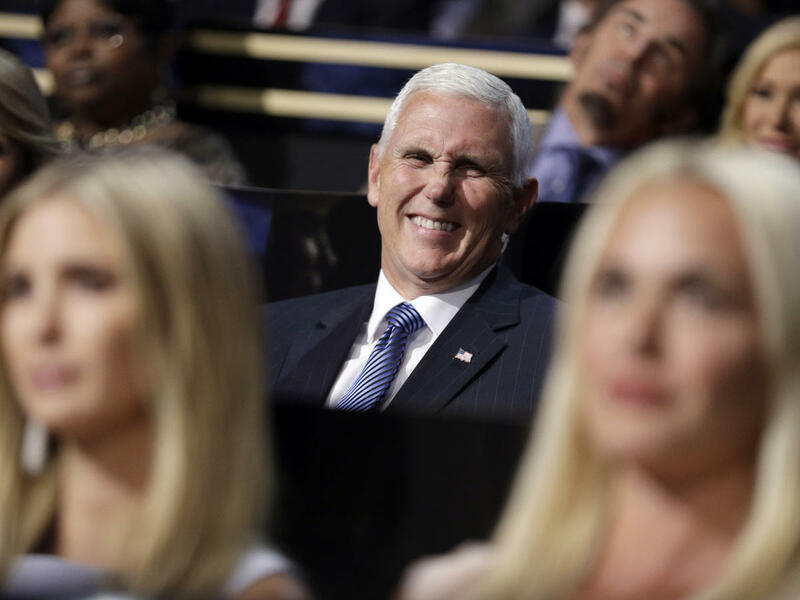 Mike Pence of Indiana smiles as he sits during the second day session of the Republican National Convention in Cleveland on Tuesday. After a night spent hammering Hillary Clinton, Day 3 of the GOP convention is being billed as a day where party leaders will lay out "the Republican vision for a new century of American leadership and excellence." A bevy of political heavy hitters — Sens. Ted Cruz and Marco Rubio; Govs. Scott Walker and Rick Scott — will tee up the day's headliner: The Republican vice presidential candidate, Indiana Gov. Mike Pence. The theme of the night? "Make America First Again." Phil Ruffin, businessman, a casino mogul.